Board games are hot this holiday season! Endless Games produces high quality entertainment in board games and puzzles that are quick and easy to learn, but offer “Endless” play value. CRAZY LEGS is a new kids game that gets players UP and MOVING! Each space on the game board represents a new physical challenge for children and families to JUMP, TWIST, SHAKE, and EXERCISE their way to victory! Korner'D from Endless Games is brand new for Spring 2013. This game is a proud partner of Autism Speaks and a great challenge for everyone, including those with special needs. Korner'D is a puzzle that's also a game! The rules are simple, just match the colors on the tile to the pattern on the board. Play all of your tiles, and you win! Korner'D is so basic-yet so compelling. It's the mind-bending, abstract strategy game of perception that brings excitement with each new discovery. Oddly Obvious is the wild new party game where the answers are all in your face. We give you the clues. We give you the answers! Just be the first person to identify and shout out the most correct answers to win. The Game of Scruples is the “adults only” party game that will challenge your moral compass as you debate how you and your friends would react to STICKY SITUATIONS and PROVOCATIVE PREDICAMENTS! Sit in the HOT SEAT and honestly reveal what you would do. Win or lose, you’ll learn a lot more about your friends AND YOURSELF than you might want to! Family Game night is going back to the Classics! I remember playing PayDay as a child and I can't wait to play it with my kids. Who doesn't like to get paid? BUT, where does all the money go? 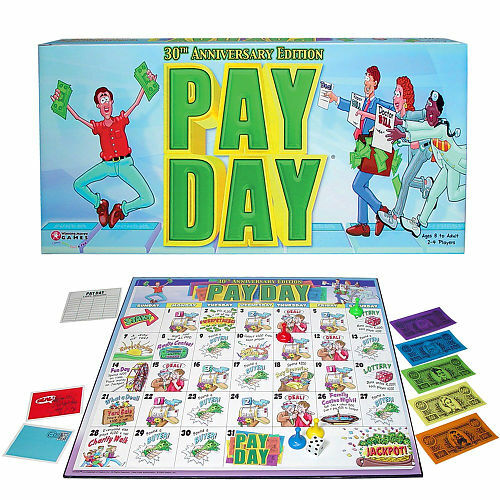 Players take turns moving along the 31 day calendar-like game board. You could make a big profit OR lose your shirt on a bad investment and have to take out a loan to pay the bills as they pile up . Don't worry, you might win the lottery or hit the jackpot and pick up a bundle! And at the end of every month you GET PAID!! For 2 to 4 player. Who doesn't like a round of Bejeweled when stuck at their desk? The online game where you try to match gems in a row causing the row to collapse. It's so addicting! Now you can take the favorite computer game from the desktop to the game table! It’s the card version of the addictive online Bejeweled game! Collapse matching cards and collect gems, and earn bonus points with Boost Gems! When the cards run out, count up points for each card stack and Boost Gem. Whoever has the highest score is the Bejeweled Frenzy winner! 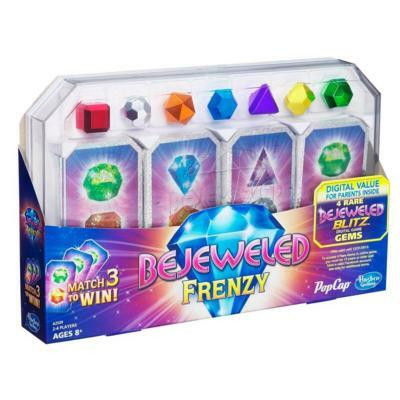 Add Bejewled Frenzy to your next family game night! The game is super easy to play. Just like the online version, you match 3 gems, collapse the matches, and collect your gems! Earn points by stacking and collapsing gems patterns. Highest score wins! There are small pieces so you will want to watch them around smaller children. Haywire has a ton of great toys just in time for the holidays! In this mixed-up animal board game, players travel around the game board collecting animals. Can you collect the animals needed to create a Birdle (Bird + Turtle)? Or, how about a Gorillican (Gorilla + Pelican)? The first player to create any two mixed-up animals wins the game! Animal Soup will teach your preschoolers colors, matching, and animals all while having tons of fun! Based on the bestselling book by Todd H. Doodler! 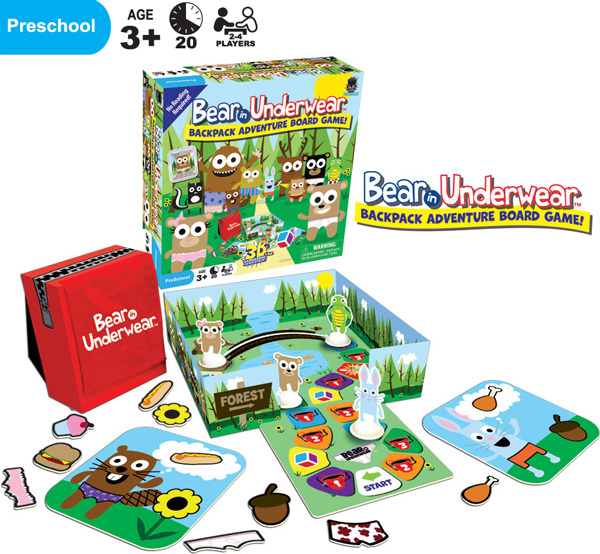 Travel through the forest collecting your animal's favorite food, forest item, and UNDERWEAR!? Reach into the backpack to grab goodies. If you're lucky, you'll grab one you need, otherwise share it with the other players. First player to collect all the goodies for their animals wins in this silly game based on the books by Todd H. Doodler! Trivia, drawing, word & number play, physical challenges and a TON of dice! Their hit game Dicecapades!™ is now available for kids and is better than ever! An absolutely hilarious game that's fun for the whole family! Uh-oh! The Robin placed numbers on the bottom of his eggs and mixed them all up in his nest! Can you get the sum of your eggs as close to the number on the rolled die while following the sometimes silly rules on the drawn card? The blue eggs have positive numbers while the green eggs have negative numbers. You'll need both as you add and subtract to your total while trying to remember which egg is which! Be careful! Your opponent might have a 'rob' card and might steal the egg you need or the egg locations might get scrambled! Player with the lowest score wins in this zany game of math, memory, and luck! Turn out the lights and try to be the last mammal standing in this survival dice game based on Latin American folklore. Each player takes six dice and rolls them. If you roll a chupacabra you can take out your opponents' chickens, goats, and oxen. Players take turns removing opponents' animals from their hands based on how many chupacabras are rolled. Be the first to collect all dice in play but watch out for "Chupacabra Loco" when someone rolls ALL chupacabras and has the power to take out the largest pack of animals in play! The best part? Everything GLOWS IN THE DARK! Can you survive the night?